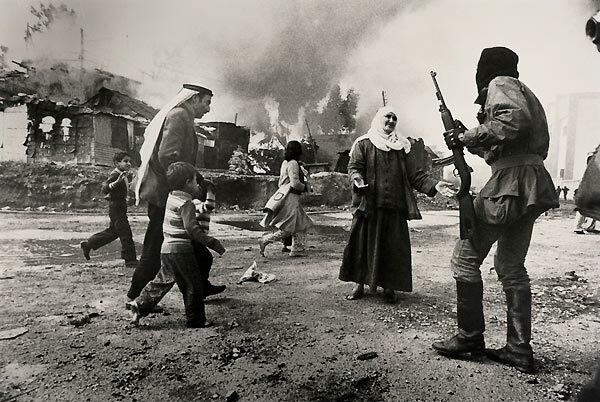 Between 1975 and 1976, the Lebanese Forces (LF) planned and executed sieges, mass expulsions, and massacres of the residents of the mixed-nationality slum of Maslakh-Karantina and Palestinian camps of Dbaya, Tal al-Za‘tar and Jisr al-Basha, and the subsequent razing of the living quarters in those camps and neighbourhoods. Maslakh-Karantina began its life as a quarantine camp for survivors of the Armenian genocide in 1915, later becoming a slaughterhouse and tannery, and yet later a shantytown housing Palestinian refugees, and Lebanese, Kurdish, and Syrian poor families. On 18 January 1976, LF militiamen, who considered the shantytown strategically important, razed it, killing hundreds of its inhabitants and expelling the remaining thousands to west Beirut (Sayigh 1997: 376). The razed site was then used as the headquarters for the LF throughout the civil war. After the war, the site lay unused and rubble-strewn, surrounded by dense urban neighbourhoods until 1998, when [architect Bernard] Khoury was asked to design a nightclub on that tract. Khoury himself says that the site was one “which I did not choose, but had to confront” (Khoury 2002). The nightclub, BO18, is situated three and a half metres underground “to make it invisible, paralleling how the shantytown was made invisible” to the rest of the city by a high wall, and the building itself is shaped like a bunker or coffin (Khoury 2002). Inside, the entry vestibule is divided from the rest of the club by a wall punctuated with small “sniper windows” that allow a one-sided voyeurism by the club clientele. The tables in the seating area are tombstone-shaped, with pictures of jazz singers on them as if commemorating the dead, and all have a small vase with wilted flowers in front of the photograph. The seats around the tables are arranged to evoke seating at a wake. The BO18 design is intended as a conversation with the public, as a controversial argument about memory and war, because “there are no public institutions for materialising this debate in architecture, and so one has to resort to ‘vulgar’ buildings such as bars or restaurants to speak about things that are being silenced” (Beirut, 13 May 2002). What I did not know then and what casts a different light on the massacre is that the January massacre in Karantina (and Nab’a) was preceded by a massacre and massive looting at the port, on 6 December 1975. The date is now known as “Black Saturday.” I already knew that on that day, the LF set up checkpoints in the city and killed hundreds of people. What I didn’t know was that on the same day, the LF militiamen marched into the grounds of the port and checked everyone’s ID cards (as they were doing at ad hoc checkpoints elsewhere in the city); on that day, they massacred around one hundred Palestinians, Syrian, Kurdish and Egyptian port-workers (among the hundreds of others killed on that day in Beirut), and kidnapped some 300 people (apparently mostly Egyptians) from the port area. According to this official, LF operating expenses alone amount to 26 million pounds a month, mostly straight salary payments. This figure provided nothing for ammunition replacement (badly needed), spare parts for equipment (badly needed — according to official LF tanks couldn’t move into action now without significant repair), uniforms, training, etc. Official noted that LF had re-opened night operations at fifth basin at Beirut port twelve days before uprising because of need for funds, so Ja’ja’ will continue to benefit from this source. On other hand, he said, with Syrians opening roadblock at Madfoun bridge, lf revenues from Barbara checkpoint have disappeared; he opined that Ja’ja’ might go as far as to offer up closing of Barbarah checkpoint as peace offering to Syria now that Syrian action has made it financially irrelevant. Even assuming lf tightens up taxation in areas under its control and perhaps expand fifth basin operations, it will still leave them, he estimated, minimum of 6 million pounds short each month. As Syrian clamp-down on Lebanese ports continues, Palestinians and leftists concerned over supply lines into country. Effective surrounding of Tripoli now leaves Tyre only leftist controlled port with open roads to hinterland. Tyre is already scene of resupply efforts. Much larger traffic through port could provoke strong Israeli reaction. However, Israel may want to keep pot boiling in Lebanon and ensure Palestinian preoccupation elsewhere. So, the takeover of the port and the massacres there (and elsewhere in Beirut) on 6 December 1975 preceded by six weeks the massacres at Karantina. What I did not know about this particular massacre (and the one at Nab’a) was that many of the Karantina and Nab’a residents worked as dockers and stevedores at the Beirut Port, and in fact their killing paved the way for a “cleansing” of the port from Muslim workers (at least for the duration of the civil war). And of course the Syrian intervention in Lebanon also gave the Phalange the logistical and military support they needed to conduct the devastating Tal Za’tar Massacre in mid-August 1976. Fast forward nearly 50 years later. The Fifth Basin is now a container terminal. And many of the survivors of those successive massacres are scattered around the world. Today, the port-workers actually work for private firms under contracts, and these private firms are owned by people with connections to the various sectarian leaders. A few things have really struck me about this terrible story. First, that business seems to keep going -and in fact flourishes- in war-time. In fact, there is a kind of ironic demonstration of this even in today’s Beirut where the war of position hums subcutaneously: as you walk east on Hamra street, the Interior Ministry is hidden deep beneath layers and layers of walls and barricades, whereas there stands the lovely modernist building of Masraf Lubnan, the Bank of Lebanon, gloriously free of barricades. And of course, there is that rather grimly funny story about the civil war: that when everything split and there were two governments in operation (and nearly until the very end, but not all the way through) the Bank of Lebanon remained unitary and lent to both governments (at the end of the civil war, however, even the Bank split). Second, that it is incredibly difficult to draw a line of demarcation between “the state” and “the bourgeoisie” as coherent and autonomous analytic categories. I think there was a time (and in some settings) where I would have argued that the state has some autonomy, but in Lebanon (as in a few other places I am studying), the state is either straight-up the “executive committee of the bourgeoisie” (albeit a bourgeoisie riven by sectarian and geopolitical interests) or a mechanism through which the businessmen can merrily profit from accumulation by dispossession. There is of course the direct and violent method of massacres as a mode of dispossession (as mentioned above), but there is also the manner in which Solidere (and so many other investment and real estate firms and other businesses in this country) use the apparatus of the state to underwrite their capital accumulation. Laws are drafted in ways that benefit the businessmen; title deeds to land are expropriated in ways that benefit these businessmen; bank secrecy laws provide a cover to the way they and their financiers move their money; eminent domain expropriations provide the push; permits for expropriation of land and for its development are granted to those with intimate relations to the state (or in fact to various ministers as is the case with Soldiere, or with Stow Capital) and on and on and on. Third, I am reading Deb Cowen’s superb book, The Deadly Life of Logistics, and one of the most fascinating chapters is about the easy traffic, the easy transformation, between logistics for war and logistics for commerce. In fact, as I write this, I am not sure that the two can be separated at all. She specifically writes about the transformation of the US base in Iraq, Camp Bucca (notorious for being a major site of mass detention during US invasion and occupation of Iraq), into Basra Logistics City. Cowen perceptively excavates the way both the detention camp and the logistics city operate under the sign of empire. I think in the case of Beirut (and perhaps even Basra and further afield), in addition to the power of the US state (ever-present through its military, its investment firms and its port management experts and managers) there is also transnational and local capital, which is not exactly US based, but which in fact is accumulated locally -through exploitation or expropriation. And the port of Beirut, battered and exploited, bloodied, abased, and used alternatively as a militia base and as a node of financial extraction, as a site of ethnic cleansing and substate reproduction of militias, presents a weird and endlessly fascinating example of how commerce and war bed each other. update: as a careful reader has pointed out the LF wasn’t LF yet, it was still the Phalange (or the Kata’ib)… Apologies about the historical infelicity. This entry was posted in capital accumulation, infrastructure, labour, logistics, Middle East, militaries, ports, shipping conditions, transport, war. Bookmark the permalink.